Santa Fe No. 5028 heading north through Worthington with a coal train for the Sandusky docks. Photo by Alex Campbell. For me 1956 was the high point of railfanning around Columbus, Ohio. There were passenger trains (about 42) some still with steam locomotives. 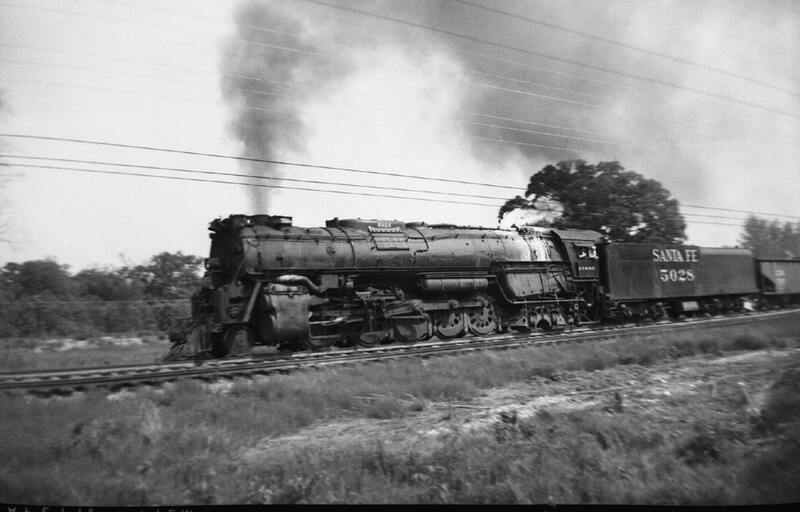 The PRR, N&W and B&O still used steam on many of their freight trains. The Ohio Railway Museum was thriving with track being added to the main line and new cars joining the collection. The 'O' Gauge Club, located in one of the Union Station arcade shops, was a busy place on Wednesday evenings. There was a lot to do, see and photograph. And then it only got better. In early May while working around the museum we heard a whistle that was new to us. Here came a coal drag acting like a merchandise train heading north on the PRR Sandusky Branch with of all things a Santa Fe oil burning, class 5011, 2-10-4 in the lead. We expected to see a PRR J1 slogging up the hill at its normal 15-25 mph. Instead a Santa Fe class 5011 locomotive, which always seemed to be going 10 mph faster then a J1 powered train, was in the lead. On paper a J1 and a Santa Fe Class 5011 were similar with the J1 having a little more traction effort, 100,100 lbs vs. 93,000 lbs, although a J1 had a booster that could add an additional 15,000 lbs of traction effort at slow speeds. The class 5011 had larger drivers, 74 inches vs. 69 inches. The J1 could start a heaver train while the class 5011 could run faster once it got the train started. It was reported to the railfans that the the Santa Fe's were slippery, meaning they would spin their drivers easier than the J1. It was also reported they steamed well and once the crew got the hang of firing with oil, easier to keep a good fire going. Some would even say they were better looking then those old grungy old J1's. According to Eric Hirsimaki, in his excellent article Buying Time on the Santa Fe 5011's in Columbus, published in the Autumn 1999, Keystone magazine, the Santa Fe's made the Columbus - Sandusky trip on average 2 1/2 hours faster then a train headed with a J1. A typical train would contain 110 cars weighing 9,430 tons. 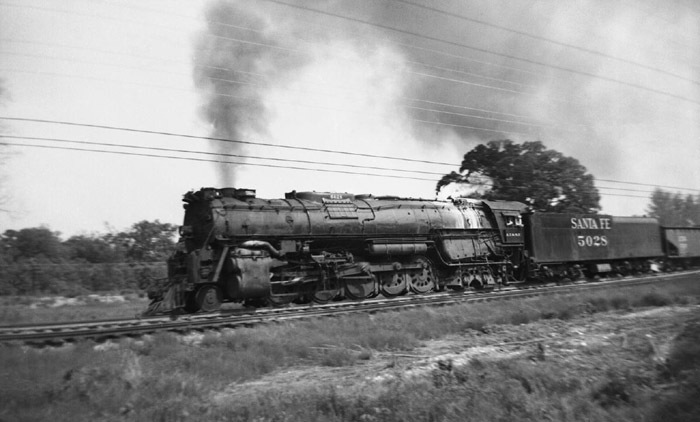 The PRR had surplus steam locomotives in 1956, the problem for the PRR was that too many of them needed expensive class repairs. It was cheaper to lease twelve surplus locomotives from the Santa Fe that were ready to go. Those sent to Columbus were Numbers 5012, 5013, 5014, 5016, 5018, 5020, 5022, 5026, 5028, 5032, 5034, and 5035. By early December 1956 all twelve 5011's had been sent back to the Santa Fe at Chicago. They were never used again. Almost all Santa Fe's class 5011's went to the scrappers over the next three years. Santa Fe 2-10-4, No. 5011, was saved and can be seen at the St. Louis Museum of Transportation. Three other 5011's were also saved, none of them Columbus Santa Fe's. By the time the 1957 lake season started the PRR had shipped six surplus J1's to Columbus, from the east, and the Santa Fe show was over.